When you think about it, the five turkeys I delivered to their Thanksgiving home yesterday is just a blip on the radar. Nothing to write home about. It took me all of about 27 minutes from the time I left my front door to the time I returned to it. Did each one of those turkeys matter to the recipient? Of course! My contribution, however small, made a difference, but what really stuck with me from delivering that food is the magnitude of need right around the corner. Literally, my turkey drop off was one block from my house at a non-profit healthcare organization serving even the uninsured. Oftentimes I remind Steve how I never feel quite at home where we live. He knows I’m itching to live in a place with white winters, pristine sidewalks on both sides of every street, and ample, accessible outdoor recreation. Yesterday, though, the thought occurred to me that diving in and getting involved to ease the stark gap in living conditions within a half mile radius of my current home might help me identify with the community here, however cold it may be. Not so different from any “inner city” or downtown area, diversity causes oh-so-much judgment, on everyone’s part. I walked into the waiting room of the clinic to track down the turkey taker yesterday, and I stood out like a sore thumb, or, I should say, I felt like I stood out. My (beat up) Kate Spade, sparkly engagement ring, and bright fuschia Patagonia made me wish we could all shed our appearances and just meet each other on the same level before anyone starts making judgments. More apparent from my brief visit to that lobby was the magnitude of need right in my neighborhood. Almost every seat was taken on a normal Tuesday morning. Everyone needs medical services, but not everyone is lucky enough to access them in warm, comfortable, suburban office parks, where there isn’t a physical glass barrier separating me from the receptionist. It was a reality check that I don’t want to just forget about. While participating in a few food runs here and there, I’ve struggled with just dropping off tons of food, given my love for food and cooking. I always wonder how the food is consumed and if I could do more by preparing it or educating the recipients about cooking or nutrition. It looks like I now have the beginning of an answer! I met Tom and Melissa (names–I’m terrible with them, and they may not be correct!) from Community Plates yesterday, and it somehow came up that I’m a personal chef/food blogger/photographer. We discussed the exact curiosities I just mentioned, how they would indeed like to provide more help to recipient organizations about how to use food donations, especially seasonal items. Sounds like my speciality! I’m super excited to learn and brainstorm how I can help out with some of my time and love of all things food. If you want to read more about my experience with Community Plates, check out my first post about them on my old blog. There only in a handful of communities so far, but check to see if they have food running opportunities in your areas–it’s an amazing, realistic concept for fighting hunger right at home. Isn’t this fun? Headings in my post, I mean. It feels so professional and magazine-like. Totally necessary to help you navigate this long, multi-subject, pre-Thanksgiving post, though. Martha’s fontina and artichoke dip first graced my table and/or mini crockpot around this time last year. I believe I tested it at Thanksgiving for possible inclusion in my Christmas menu, but the test run was totally unnecessary, because this stuff is rich, creamy, sweet, and a total crowd pleaser. It’s two-faced as a Thanksgiving appetizer, because you risk having the host mad at you as you spoil everyone’s appetite. It’s nearly impossible to stop scooping crostinis full of browned fontina and white-wine infused artichokes into your mouth once it’s placed in front of you. 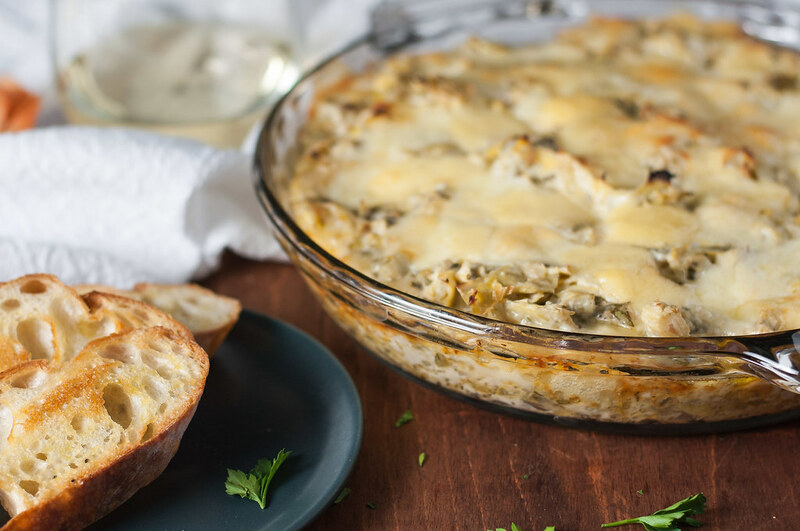 For Christmas last year, I prepared and froze the dip more than a month before baking it, so here’s what I suggest: as you make this for a Thanksgiving appetizer or lingering relatives over the weekend, just double the recipe and freeze half for a later date. Christmas, movie night, heck, me and Steve even ate the leftovers for dinner this week if I’m being honest. And never fear, this dip is mini crockpot friendly, so it travels well. 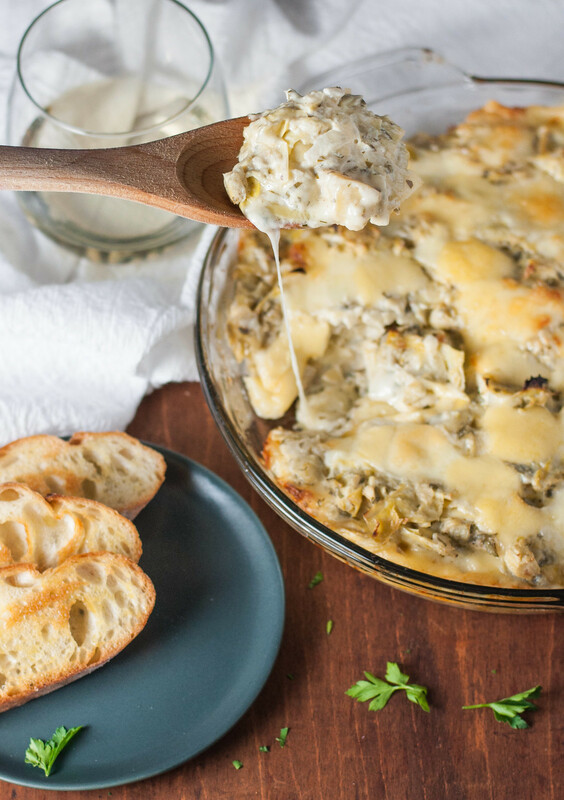 Instead of baking it in a pie plate or other casserole dish, plop the prepared dip into the “crock” portion of the crockpot, top with fontina cubes as directed, and bake that baby right in the oven just before leaving the house. Carefully place the baked dip into the outer heating element of the crockpot, cover it, allow the pot to warm up on low for up to a half hour if time permits before leaving, then unplug it and go. Baking the dip in the oven isn’t essential if using a crockpot, but I do like the look of the bubbly melted cheese on top. To skip the oven step, stir all the cheese called for into the dip, instead of reserving a cup for the top. Place prepared dip in the crockpot. To “cook it”, heat on high for 15 to 30 minutes, then turn the setting to low heat or warm, uncover, and watch it disappear. Note that dip is safe for eating after heating it on the stove. 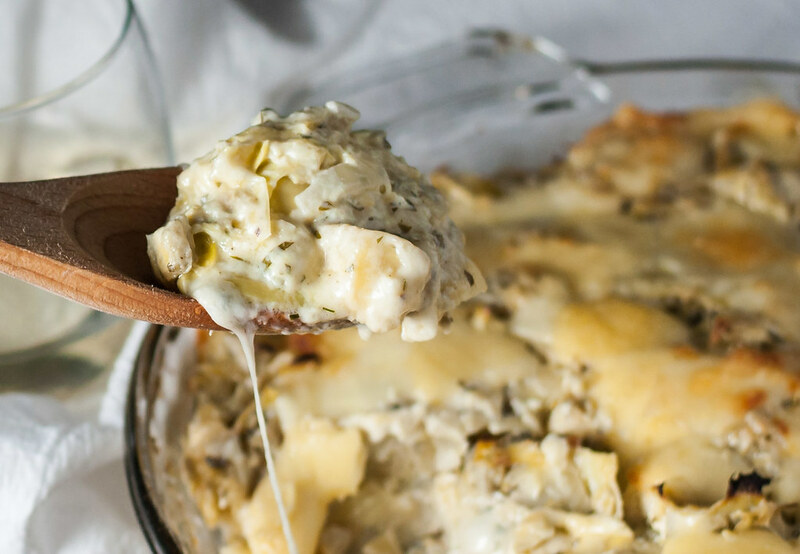 The purpose of baking it is to melt the fontina for the full, bubbly effect. Happy Thanksgiving Eve to everyone! I hope you enjoy a day of unplugging from distractions and the daily grind and connecting with family, friends, pets, good food, football, and old and new traditions. 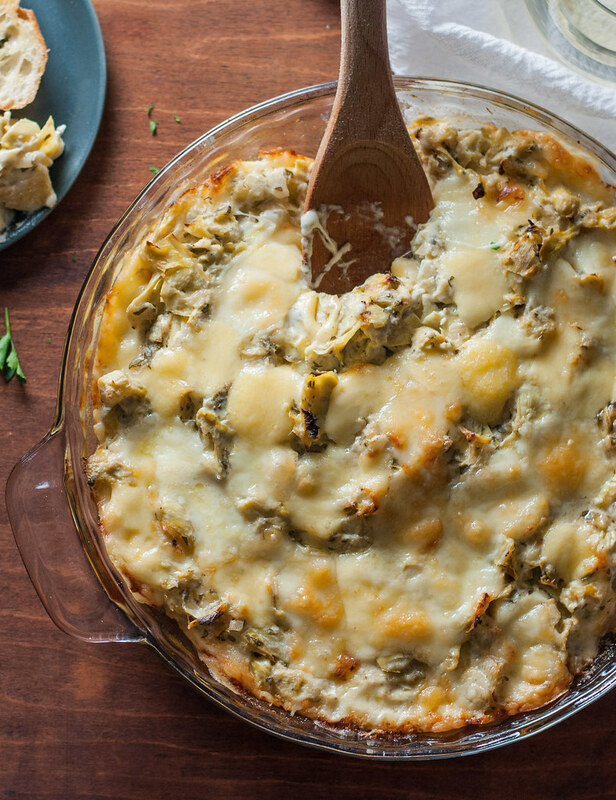 Based on Martha Stewart‘s Artichoke Dip with Fontina. Special thanks to my sister, Tristyn, for her hand modeling and photography assisting. In a skillet, heat olive oil over medium heat. Add onion and cook until softened, stirring so it doesn't brown, about 5 minutes. Add garlic and cook another minute, until fragrant. Add artichokes and wine, stir occasionally, and simmer (increasing heat if necessary) until liquid has evaporated, 5 to 10 minutes. Turn off heat and stir in cream cheese until melted and blended. 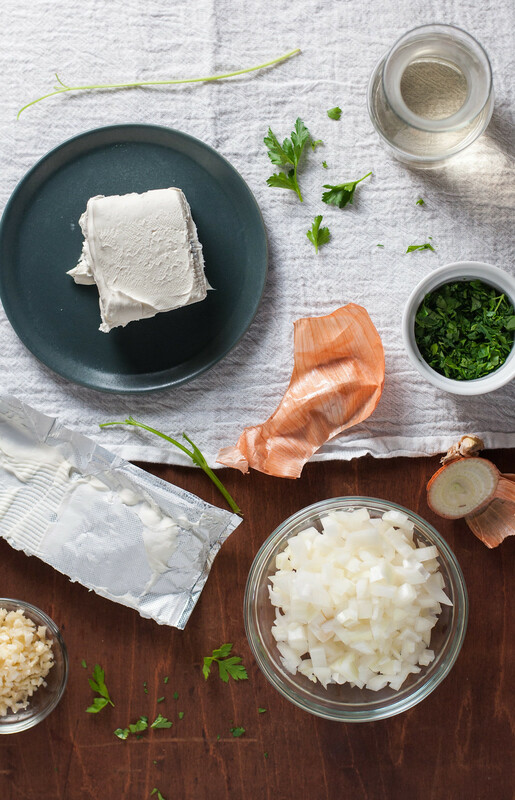 Then incorporate all but 1 cup of fontina cubes, parsley, and salt and pepper to taste. 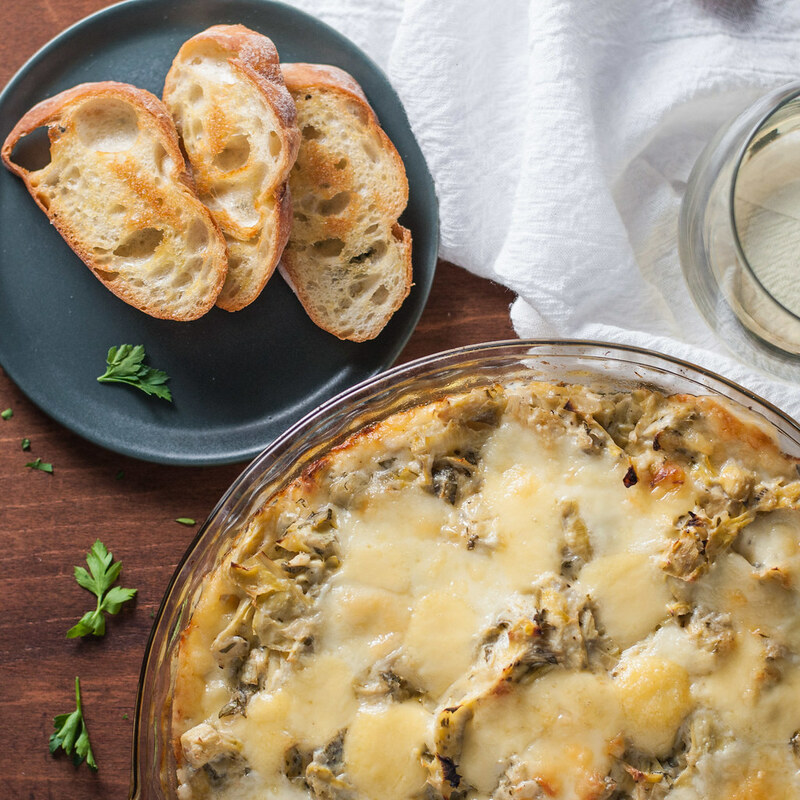 Arrange in a pie plate or medium baking dish, then top with remaining fontina cubes. Bake about 30 minutes, until bubbling and beginning to brown on top. Allow to cool 5 minutes, then serve with crackers or crostini. To make crostini, preheat oven to 425. Slice baguette into ½" thick slices, then brush both sides of each lightly with olive oil. Sprinkle with salt and pepper. Bake for 4 minutes, then turn slices over and bake another 3 to 4 minutes, until crisp and golden. For extra flavor, rub one or both sides of each crostini, while hot, with a cut clove of garlic. See details in the post above for make ahead and crock pot instructions.